The 2018 Dodge Challenger has one of the most powerful engines for an American muscle car, and it’s one of the top sports cars in its class, ranked number five. With several different trims and a powerful V8 that puts out incredible horsepower, many drivers love the Challenger’s fresh design and insane performance features. 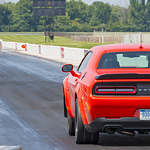 It’s all about the acceleration in the latest Dodge Challenge. The 2018 puts out 305 horsepower at the base with 268 pound-feet of torque with a V6 3.6-liter engine. Of course, you probably want to upgrade to the V8 models that can put out an incredible amount of power. This goes all the way up to the R/T and T/A trims that feature a 5.7-liter Hemi V8, producing 372 horsepower and 400 pound-feet of torque. Want to experience the thrill of driving the new Challenger? Stop by Leckner Chrysler Dodge Jeep Ram for a test drive.